Over the centuries, much has gradually been revealed to us. But it seems now, having entered the Age of Aquarius, we are gathering momentum, and discovering and learning more and more all the time. 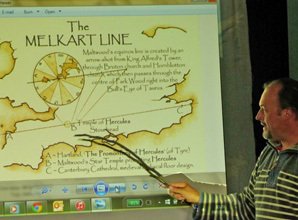 In his talk on 9th July, Yuri Leitch from Glastonbury introduced us to Mrs Katherine Maltwood (1878-1961) who wrote several books filled with hints regarding the existence of the Glastonbury Zodiac. 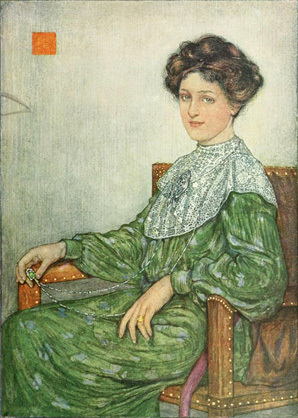 She was also a pioneer in astro-archaeology, the science of dating events by studying the placement of the stars at the relevant time. Yuri and a group of like-minded folks recently formed the Maltwood Society, in order to learn and discover more from her hints and ideas. Using both nature’s own boundaries, and ancient historical landmarks in the landscape, they have established many forms, e.g. a dog complete with ear and nose, and a bull, whose eye probably gave rise to the expression ‘bullseye’. The fledgling Society’s discoveries have become increasingly exciting as they have been able to substantiate their findings with historic links to the Bronze Age, the Romans, the Knights Templar, seventeenth-century Freemasonry, and even in the ancient words of songs from Morris Dancers and Mummers. For example, words in an ancient Morris song mention having ‘burnt the dog’s tail’. This seems to refer to when Somerset apple orchards were deliberately torched during the Civil War (1642–1651), important when cider was safe to drink and water was not. Again, many important symbols can tell us a great deal if we can only figure out their meaning and significance. The diamond shape, seen on 5,000-year-old kerb stones at New Grange in Ireland, is repeated throughout the English landscape too, reoccurring at Mapledurham House, near Reading, and treated with great reverence. 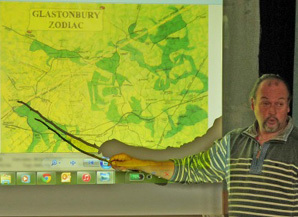 Yuri showing a map of the Glastonbury Zodiac showing a dog, horse, and bull’s head. All of art is littered with symbolism, allegory and myth, and the French artist Nicolas Poussin (1594–1665) was a leading exponent. His ‘Choice of Hercules’ and ‘Shepherds of Arcadia’, with its links to Shugborough Hall in Staffordshire and Rennes-le-Chateau in France, need further research and understanding too. Myths, legends, word-of-mouth stories and old wives’ tales have survived for good reason. They weren’t simply figments of the imagination, they had a sound base in facts and experiences. The origins and evidence are there if we seek with open minds and free our own imaginations. Yuri also referred to our old friend, the Michael and Mary Ley Line that runs across England from Land’s End in Cornwall to the eastern coast of Norfolk, passing through Glastonbury and Avebury en route. Although Yuri says he is not a dowser, it seems to us that many of his and the Group’s discoveries are based on the same concepts - intuition and intent. Their findings include many other straight ley and energy lines that link other important sites in Somerset and Wiltshire, and lead Yuri to suggest that our dowsing skills could contribute mightily to the work and quest of the Maltwood Society. New discoveries and connections are being found all the time. Would we be allowed, for example, to dowse one of their more amazing discoveries, ‘The Face’? The Knights Templar were accused in 1307, amongst other things, of worshipping ‘The Face’. Was this ‘The Face’ discovered by accident in a coal shed in Somerset which is now in the Glastonbury Museum? Further research is needed in so many areas, at so many levels, and our two Groups’ combined skills could enhance the gathering of momentum, so that we continue discovering and learning more and more all the time.